Mason Darrell Barrett is a federal administrative judge now, but he still remembers the highlight in his life when, as a 12-year-old, he power shifted that new 396-horsepower Chevrolet Malibu. “I remember it like yesterday,” said the Equal Employment Opportunity Commission administrative judge whose Birmingham District Office oversees Alabama, Mississippi and northern Florida. Barrett, a 1973 Linden-Kildare High School graduate, said he loves his work of almost 30 years in hearing employment discrimination complaints relating to disability, race, age or gender. He has a home in Linden and one day will retire there. Mason Darrell Barrett has this 1940 photo of his mother, Audrey Mae Barrett, teaching school in the Macedonia Elementary School in Linden. He proudly carries it with him. He was in Linden on Saturday to help clear the Old Macedonia Cemetery, and several of the local sights reminded him of growing up here and his love of car speed. In those days he would come to town with his school librarian mother, Audrey Mae Barrett, and her teaching friend Mary Shurn. The two would shop while he would go hang around with Dub Body, the make-ready car employee for Tom Lanier’s Chevrolet Company. “I would go there every chance I could. I was fascinated with cars,” Barrett said. Some time later, Barrett got the chance again, this time with a new 396-horsepower Chevrolet Malibu belonging to a cousin. “They let me drive it, so at the stop sign on Highways 8 and 11, I stomped on it and power-shifted it and could feel that big block engine come to life. Perhaps those experiences transferred somewhat to the fast lane of life for Barrett because he soon left Linden-Kildare High School for Prairie View A&M University to earn a degree in mathematics. He became a computer engineer, but later, in 1984, decided to attend law school at the University of Denver in Colorado. “My dad had wanted to be a lawyer,” Barrett said. Instead, M.J. Barrett had been an important local educator. He was a former principal at Macedonia school in Linden as well as a Perfection Elementary principal in Kildare from 1958 until integration in 1969. His wife, Audrey Mae, was librarian. Darrell Barrett had one sister, Audrey Elaine Sam, who graduated from L-K High School in 1972 and became an assistant principal in Houston. Brrett was tall at 6 foot 4 inches and wanted to play football, but his dad had been injured playing and wouldn’t allow it. “So I played tuba in the band and we were sweepstakes winners for four years, and I was in the all-district band,” he said. He had two sons who played football, however. One earned a full scholarship to a Colorado school and the other walked on to the team at Texas A&M University. One is now a banker in Colorado and the other is successful in Europe. Barrett said he’s simply a country boy and glad to be back. He’s had a long association with the Macedonia Baptist Church founded in 1894—the one African-American church inside the Linden city limits, he said. Like a number of Linden buildings, the church had been made of the red rock, which is substantial and thus the building still serves as the church’s annex. Barrett also has a great-grandfather who was one of the four Rambo brothers who helped form the Rambo community near McLeod. These were Alonzo, Benjamin, Nate, and Darrell’s great-grandfather Monroe. 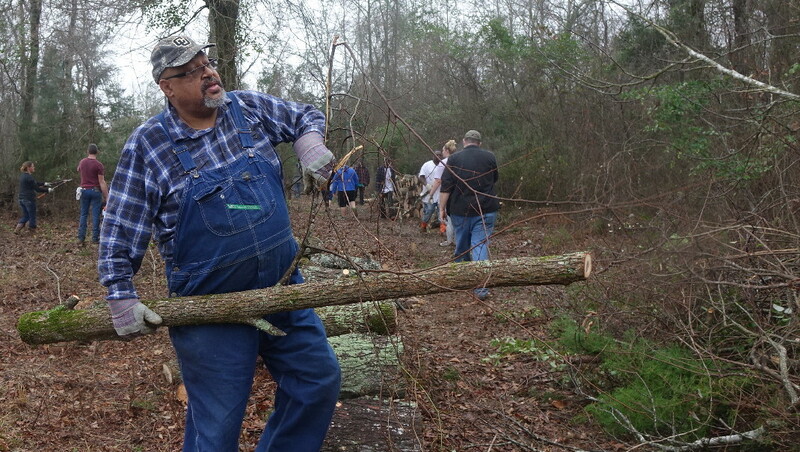 His work with the heritage and cemetery associations is an effort to help preserve the heritage of the African-Americans in the area, he said. Preserving Historic Cemeteries and Grave Markers are not only a place of burial but they also provide a vivid record of community history. Thanks to Joby McDaniel and the Community Service Probation Crew, members of the Macedonia Missionary Baptist Church, Linden Cemetery Association and Linden Heritage Foundation progress is being made on the “Old Macedonia Cemetery”. More clearing of trees and brush is needed before the marked & unmarked graves can be identified. This is hallowed ground. As with the 1939 Linden Firehouse work has just begun. Great story. I feel privileged to have met Mr. Barrett during our workday at the Old Macedonia Cemetery. Great story! I grew up in two small communities just outside Baton Rouge. I am also a country girl who loved fast cars.. My parents both grew up on farms near Baton Rouge. I fell in love with Linden a couple of years ago when I came there with friends for a JD Souther concert at MCT Theatre, and joined the Linden Heritage Foundation soon after it was formed. It’s a wonderful, friendly beautiful place. There’s nothing quite like country living..❤️ So happy that so much restoration is being done in Linden.